Come see some intriguing, accessible, beautiful art. 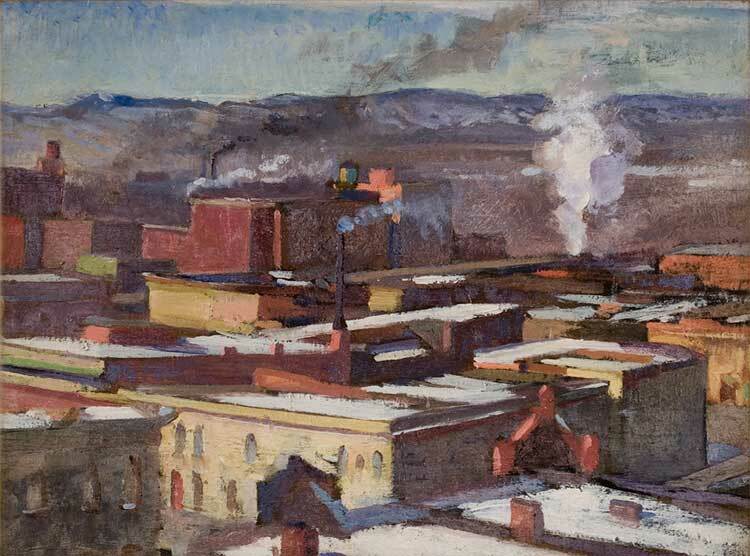 The Denver Public Library opened a new show, honoring the founders of the Denver Artist’s Guild; it runs through August 29. See it early. There’s so much there and it highlights so many levels of interest, you’ll want to revisit it. Remember to pick up the impressive, fact filled, handout and marvel at the labor of love by volunteer curators, Deborah Wadsworth and Cynthia Jennings, You may even find yourself captivated by the art history of Colorado. Easy to view, engaging – it’s downright viewer-friendly. The library setting, with art hung on the ends of bookcases and in nooks throughout the room, gives the display a make-yourself-to-home informality. Some art shows try to awe the viewer with a mighty, expressive gestalt. This one invites an unhurried look with discoveries of surprise, insight, and thoughtfulness. Appealing to many different interests. There sure is uplifting beauty and style diversity here, but this comfortable gallery is the Western History Department, after all; the display has Colorado’s story laced through. Colorado’s story, era, context – that’s the stuff of this show mixed with the question: “Who were we?” This show is the truth about Colorado art eighty years ago, with real paintings, sculptures, prints, contemporary magazines, and ephemera. Both the show and the truth are long overdue. Let’s have lots more like this. “Who were we?” has been the stock in trade of Western History since somebody first asked. 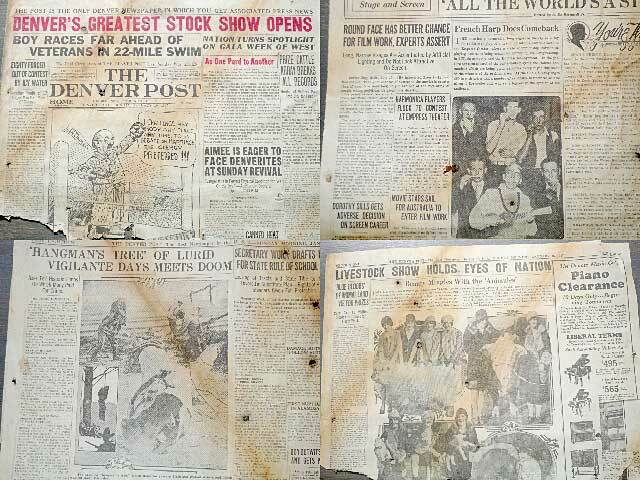 Patrons come with a desire to read a story from a newspaper published a while ago, consult a city guide from the 1920s, find out when their parents first came to town and where they lived. Nowadays, examples of the question are everywhere and in new forms. The computer-accessed Facebook-driven “Buckfifty” examines the past 150 years of Denver from any contributor and in any form. Many have status “pioneer” license plates on their cars. The TV advertises genealogy resources for the ordinary viewer. PBS offers The American Experience, Baseball, the Second World War, and many other programs that mix revisionism with nostalgia, tall yarn with true account. Although contemporary art lives in an eternal present, “Who were we” has a premier place. That’s what museums are all about. Although regional art has had a tough time gaining respect in the national arena, scholars come to examine the resources and tell the story. After all, there are only so many books that can be written about Jackson Pollack. Don’t look now, but the internet has changed the entire outlook of history, art, region and popularity. It all began with ebay. Ordinary art lovers of all stripes, of all levels of education and understanding, see thousands of pictures every day. The patron numbers are growing exponentially, and so are the offering numbers. Newbies may not ponder what art is or even reflect on what they want, but they gain a better idea looking at picture after picture, click after click. Ebay changed art and enjoys a vast following: Everyone wants to get in on the act. Every gallery and many artists have their own webpages. Art data sites like askart.com and artnet.com offer biographic material, price information, bibliography, and the opportunity to plug in, to those who are professionally part of the market as well as to others who share the passion. Regional art scholarship continues to grow, giving collectors and armchair historians all sorts of new resources. In 1976 the Samuels’s book, Encyclopedia of Artists of the American West, pioneered new art history ground with a Western artist biographic work. Since then the newly published work about regional – and ever popular – art provides more no-nonsense information. Now desktop publishing enables more scholars to publish text, and the availability of cheaper printing methods make those texts attractive, illustrated with color pictures. Institutions have started showing the treasures of Colorado’s past. Every year, displays of art from public and private collections find enlarging audiences, and show catalogues and information sheets are added to lists of new-artist biographies to research. Denver Artist’s Guild Founders at the Denver Public Library is an invitation to join in the contagious passion for art. We are who we were. You may ask. “Which is your favorite?” I’m guilty of asking that same question of many attendees at the opening party. Here are five artworks not to be missed with some reason and insight why. Gladys Caldwell (Fisher), 1906 – 1952. MOUFFLON, granite sculpture and MOUNTAIN SHEEP, Plaster sculpture. Here’s a side-by-side-on-the-same-table study of maturity and mischievousness youth. The Denver Public Library is lucky to have the plaster studies for the celebrated post office big horns – a trademark symbol of Colorado. The works demonstrate all the natural, as well as 1930’s heroic, unities; solidity, staid strength, design, singularity. Here’s comedy and delight. In the 1920’s a very youthful Gladys made a similar work , the Moufflon, probably while studying with Aristide Maillol. The twenty-somethingth artist gave the sheep lots of personality and vitality, especially considering the unforgiving space of the smallish granite block. She made a fanciful pattern of the horns and set a broad grin on the sheep’s face. By 1936 Gladys was internationally known, in the 1920’s she showed a sense of devilish humor and playfulness. Say the magic words “American Impressionism” and summon the story (now a popular art book topic) of how America had our own impressionists, right here. Who’d a’thunk that little ole’ Colorado had vital impressionist painters of the first water amongst us? Robert Graham was one of the best. He had a distinctive sunny palette and, I’ll bet, a happy heart. He used his J. H. Twachtman and Robert Henri training to show beauty and dignity of the Colorado landscape and he taught many in the same spirit. You cannot look at one of his works without a spirit-redemptive smile. I’m a sucker for Colorado skyblue – and I’m unashamed. Here’s one enchanting, “arty”. work; it’s a painting about painting. Anne Ritter gave everything to it: sunlight, contrast, color theory, design … and real power. That power is the absence of specific mountain subject. 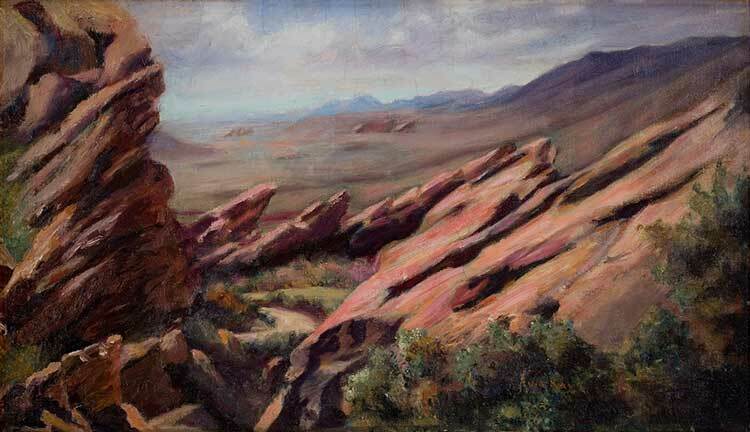 One might ask about a Colorado landscape show, “Where would the artists be without Long’s Peak or Pike’s Peak?” This work is Anne Ritter’s answer. She made mystery, magic and pleasure from the ordinary. Here’s a story of loss for you. 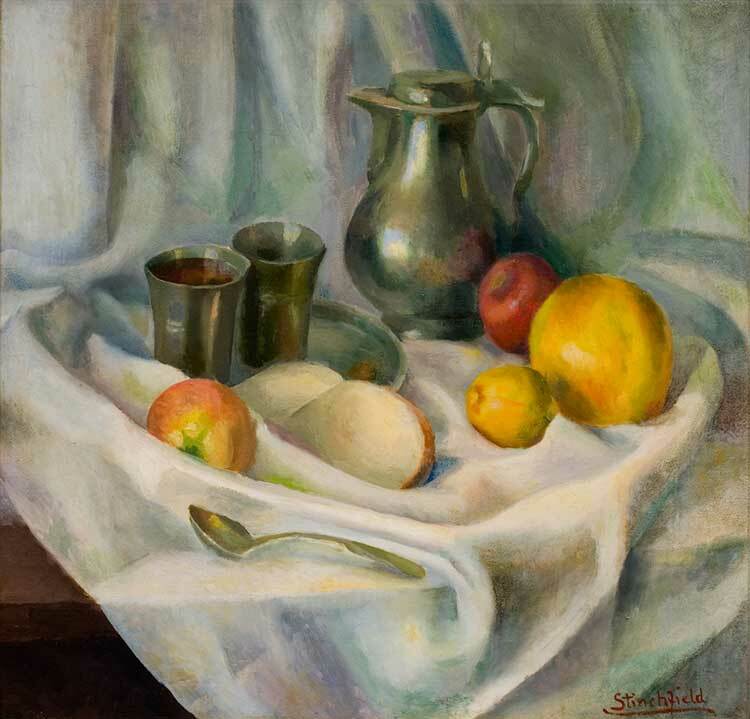 In addition to marrying Artus VanBriggle and having distinction as a ceramic artist, Anne Ritter enjoyed a renowned painting career. She showed in many national shows, headed – and helped found – the Broadmoor Academy / Colorado Springs Fine Art Center, and taught. Sadly she had no children or local heirs. When she died, her estate was shipped to a niece in New York City. There, all her paintings were combed into the 1930s secondhand market, far from where they were created. This remaining known work may be the best to be seen. 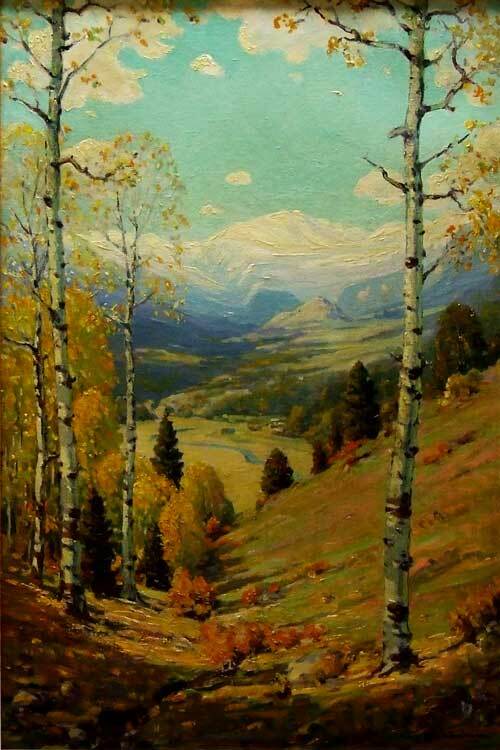 There’s a lot of current mention of plein air painting in Denver; the DPL hosts an annual show of this art style every autumn. For all the artists of slavish sunlite flowers and random Denver street scenes I offer you Denver Rooftops, a plein air masterpiece. Here’s magic in commonplace and common feelings. Much of this magic is everybody has painted this work in their heads, looking out a third story window at the city below. We’ve all mentally organized the child’s blocks or patchwork pieces of the buildings beyond the window. The zig-zag snow and the overcast sky add to a feeling of introspection. The blowing steam pipe gives the only action to a building still life. Let me throw a big, M-80-sized firecracker at the thought that history represents a sense of placidity and happy stillness. The contest between humanism and elitism ran bitterly and deep in little “D” even in 1928. Newspaper articles about the Denver Art Guild’s opening exhibit quoted David Spivak speaking about the inclusive force and redemptive power of art, and how he believed that art and beauty helped shape better citizens and better human beings. These opinions were quickly and publicly reviled by upper echelon Denver Art Museum personnel, who insisted that only the educated portion of the populace could appreciate art. John Edward Thompson. 1882 – 1945. DECORATING THE DENVER NATIONAL BANK BUILDING. Oil on canvas. Subject! That’s why I choose this painting for mention. Here are grown men with every type of tobacco product and with a yeomen artistic worker-bee look. They’re a’working on a massive art project. Not only does the painting debunk the ever popular and unstoppable “starving artist” mentality; it also shows that sense of urban optimism that Denver has spoken to the world. “Denver – The City Beautiful,” “Imagine a Great City,” and the next civic slogan are more than feel-good politics. The spirit of optimism and beauty must be in the water. Denver radiates it; always did. B50 Note: Since 1972, Stephen Savageau has run the Savageau Gallery in Denver. Denver Artists Guild Founders: Fifty Two Originals is on display at the Denver Public Library, Level Five, Gates Reading Room Gallery, through August 29th, 2009. 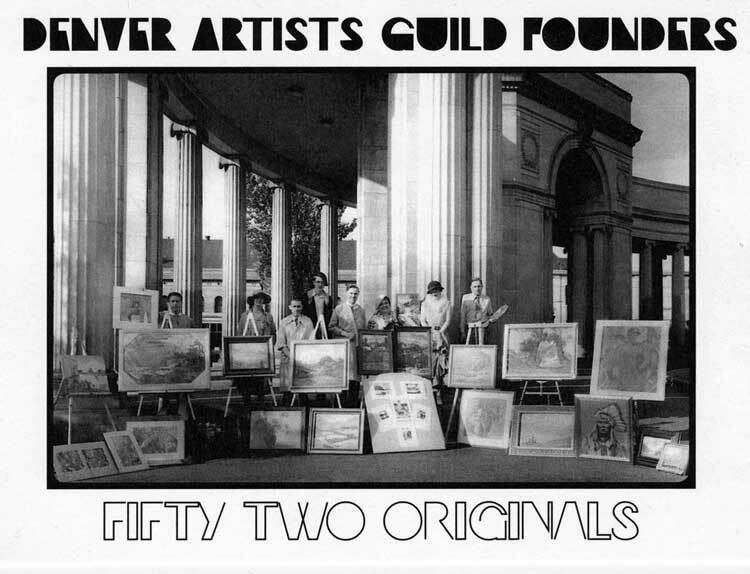 The Denver Artists Guild was founded in 1928. Renamed the Colorado Artists Guild in 1990, it is the oldest continuously active fine arts organization in the Denver area. Although I was born in Denver and have lived in the surrounding area my entire life, I didn’t actually move to within city limits until 1999; the summer I turned thirty-eight. That same summer I met my wife, Donna, and a year or two later we met our friend John Henderson, a tall, slender African American man with a glowing character. We met because Donna and I walk our dogs together on a near daily basis, frequently to City Park, a journey that takes us by John’s storefront if we take the 21st Street route. If you happen to peer in while passing by you can see his collection of imported African arts and crafts, and on the days he’s there (Friday and Saturday), with a closer inspection you can see John sitting in his frayed office chair reading a magazine, listening to the radio or chatting with one or more of his many friends. He’ll be eighty-eight years old this summer, but has the mind, body and spirit of a much younger man. Before John opened his store (The African and American Trading Company) at 2217 E. 21st Ave., he was Denver’s first African American architect and the first licensed in Colorado. He worked for many prominent Denver architectural firms, including his first job with Fisher Davis & Sudler in 1959 (working on the Federal Courthouse), and Gio Ponti & Sudler (on the first Denver Art Museum). He worked on the Denver Botanical Gardens and a slew of other architectural gems in Denver. In 1961 he designed a modern home for himself and his wife Gloria, which is near his store. The home is adorned with full height panels of glass and clean lines, reflecting the style of his favorite ‘master architect’, Mies van der Rohe. At the entry John has created beautiful window weight sculptures, and at Christmas he and Gloria assemble large mobiles of ornaments you can see through the full height corner windows. John has been retired from architecture since 1981, and lives a much less complicated life at his store selling eclectic African art for two days a week. His store has baskets, carved wooden bowls, phone wire art, jewelry, and tribal dolls. He also sells some American art, and odds and ends such as assorted teas, nuts and maple syrup from Vermont. But he has said that the main reason he has his store is for the opportunity to engage with people who pass by, and those who, like me and Donna, come by routinely just to see him. It’s rather like a barber shop environment, where you can sit and swap stories, or just take in one of his stories from his long and remarkable life. B50 Note: Patrick Stephenson is an architect who lives near City Park with his wife Donna and their dogs Waylon and Huck. You can find out more about his work at his website. —by O. J. Goldrick. 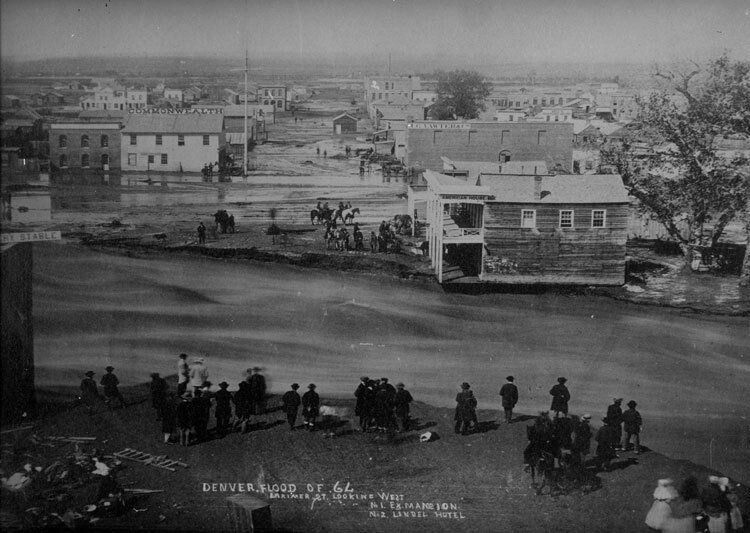 First published on May 25th 1864 in “The Commonwealth”, six days after the Denver flood. Great God! and are we all “gone up,” and is there no power to stem the tide was asked all round. But no; as if that nature demanded it, or there was need of the severe lesson it teacheth to the citizens of town, the waves dashed higher still, and the volume of water kept on eroding bluffs and bank, and undermining all the stone and foundations in its rapid course. The inundation of the Nile, the Noachian deluge, and that of Prometheus’ son, Deucalien, the Noah of the Greeks, were now in danger of being out-deluged by this great phenomenon of ’64.